Boat-access means you cannot drive to this property, you must get there by boat. Secluded, private, great fishing get-away cabin and camp for memorable times with buddies. Located on Elbow Lake 14 miles north of Cook, MN, just 5 minutes from public boat launch for Lake Vermilion. 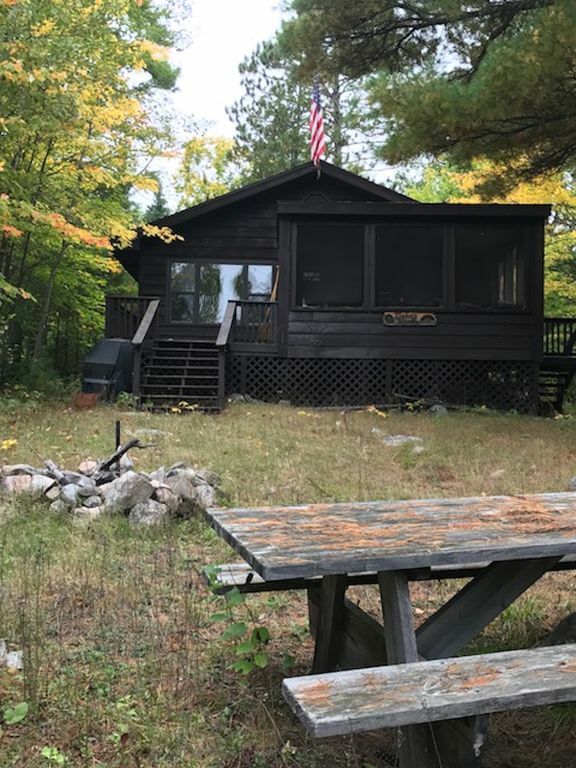 This cabin is a BOAT-ACCESS property 2 minutes directly across the lake from Elbow Lake Lodge, 5 minutes from two separate public boat launches at either end of the lake. 2 Bedrooms (1 double), (1 double futon + bunk bed set). Separate loft with sleeping cots. In total 6-8 can sleep off the floor. Kitchen with propane refrigerator, stove and propane lights in all rooms. Large screened porch, deck and fire pit with picnic table. Fish cleaning table, gas grill, dock and lake water system. Clean odor-free outhouse. All are welcome, but this is a remote and rustic experience. It is very clean and comfortable. You must provide your own boat and be comfortable with it as your means of transportation in any weather/water conditions. Kitchen is fully furnished with dishes, silverware, cookware, glasses, etc. Bed sheets and towels are also provided. Haul drinking water in from the mainland with your groceries for your stay and never go across the lake to "civilization" - just enjoy the seclusion. Get away from technology and enjoy the solitude of the woods, the lake and the fishing. No TV or internet access. Cell service is spotty at the cabin - it is good across the lake at Elbow Lake Lodge. The lake is a "conservation lake" so there are not navigation buoys that mark hazards. Maps are available to identify hazard areas for you. The lake has no slots for fishing, anything you catch can be kept at your discretion. Elbow Lake Lodge directly across the lake is a beautiful facility and it hosts a restaurant, bar, small convenience shop as well as bait and boat gas if you need or want any of those items. You can call them and possibly make arrangements for boat launch and parking your car/trailer while there if you choose to not use one of the public launches. Dogs are welcome but the property backs up to state forest land so if they take off you might not get them back. Cigar smoking (or other) is allowed outside on the screened porch, at the bon fire pit, etc. A lake water system pumps water up from the lake for washing dishes and cleaning off, but not drinking. Dock is wide and sturdy with a depth at the end near 6'. Property sits on a point with great views in all directions. Swim and float off the front point - it is a rocky shoreline so the depth changes frequently. You will want to wear water shoes off the point but it is a great spot to bathe and relax with a cocktail. If the weather is cool or damp, the cabin has a large wood-burning stove for heat.